It's Halloween, and things are getting scary . . . Okay, so maybe not scary, but we did have a fun Halloween holiday. Kyle and I always have some serious discussion when it comes to deciding what Grace will be for Halloween. After going through a variety of choices, like a mermaid or a truck driver (that one was Kyle's), we decided on one of Grace's favorite characters, Minnie Mouse. 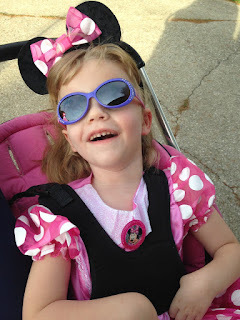 And we picked up her costume at Toys R Us one day when we were in Springfield for physical therapy. 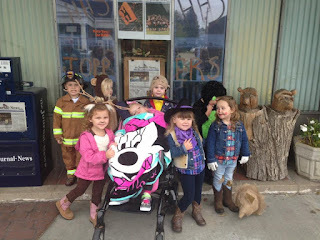 Grace and her preschool friends at their Halloween party. Grace's Halloween fun started just a few days before Halloween with a party for her preschool classmates. We dressed Grace up in her costume, and she and the other kids in her class walked uptown to trick-or-treat at local businesses, including the newspaper office. It was kind of cold that morning, so we sent Grace with a Minnie Mouse blanket, which covered most of her costume. After they got done on their walk, they enjoyed some Halloween treats in the classroom and watched "It's the Great Pumpkin, Charlie Brown." I think she really enjoyed seeing all her friends in their costumes too. 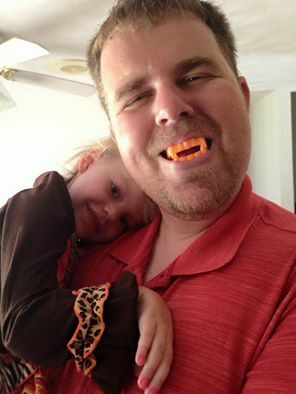 Grace and her daddy being silly with Halloween treats. The very next day marked Hillsboro's Halloween parade. The chamber also puts on a trick-or-treat trail, where kids could visit local businesses in costume, but we opted just to do the parade this year. Usually we stop by the newspaper office and Grace's physical therapist. Our sweet little Minnie Mouse. Family photo opportunity with Minnie Mouse. Since Friday was such a pretty day, we walked from our house uptown in time for the parade route. 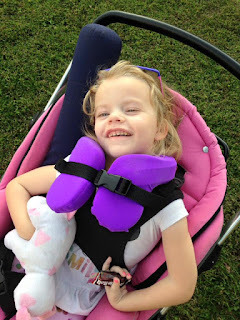 For the past two years, Kyle and I have built part of her costume around her stroller. And this year, we talked about making some big bows for Minnie's Bow-tique, but as we are in the middle of a home renovation project, we just didn't get that done. It's also the reason we didn't get our pumpkins carved this year. We even got a Finding Dory pumpkin carving kit and a pink flamingo pumpkin kit, but we will save them for next year. 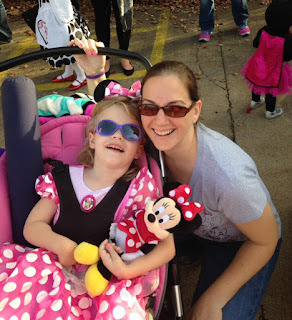 Mommy and her favorite Minnie Mouse. Hanging out with Grandma and Grandpa before the parade. Because the weather was gorgeous, there was huge turnout for the parade, and Grace loved seeing some of her preschool friends. We walked along the parade route, and it was fun just to be together as a family. It turned out to be a gorgeous Halloween weekend, and Kyle and Grace ended up riding with me to Litchfield to cover their Halloween parade on Saturday. 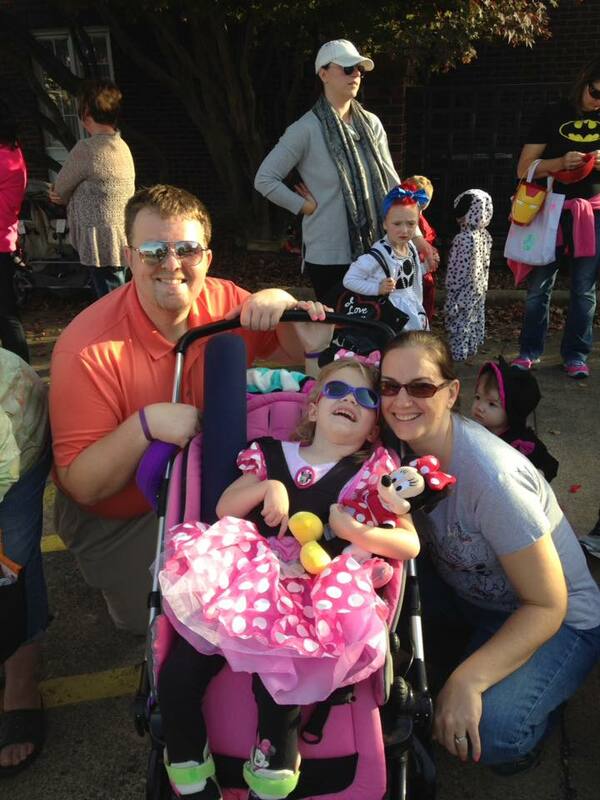 We didn't dress Grace up, but she still managed to get some candy from some people in the parade. As it gets harder and harder to put Grace in and out of her car seat, we decided against actually going trick-or-treating this year. 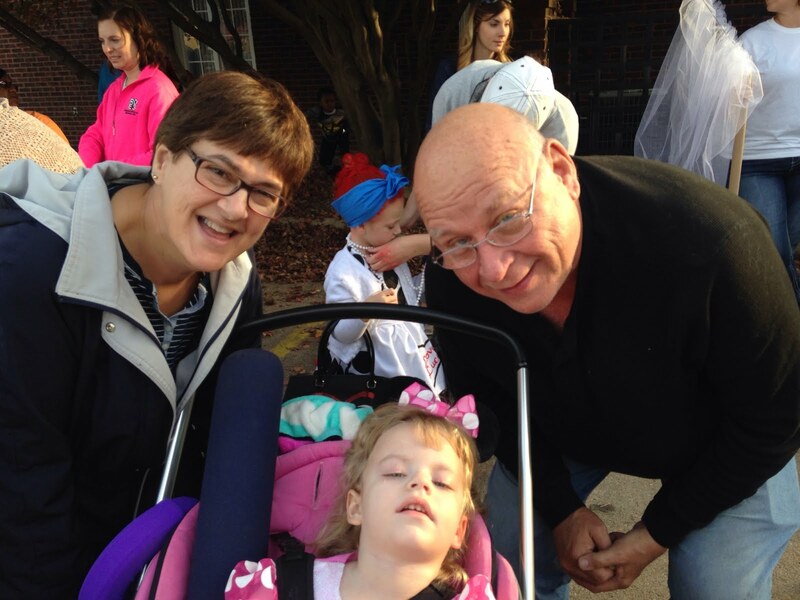 Sunday was paper day, so Grace hung out in Raymond with Grandma Kim and PaPa Randy, who live out in the country and don't really get trick-or-treaters. Although Kyle did tell his mom that he put on Facebook Grace would be waiting to greet trick-or-treaters at their house. I think he was only kidding though. Grace got some candy at the Litchfield parade. With our house in disarray, mom and dad invited us to dinner at their house on Halloween and to greet trick-or-treaters. After a delicious steak dinner, Grace got some new pajamas for Halloween, and we settled in to feed her. Mom and dad greeted the kids as they came to the door, inviting in ones that knew Grace. Several from her class stopped by to say hi, and she really liked all the attention. 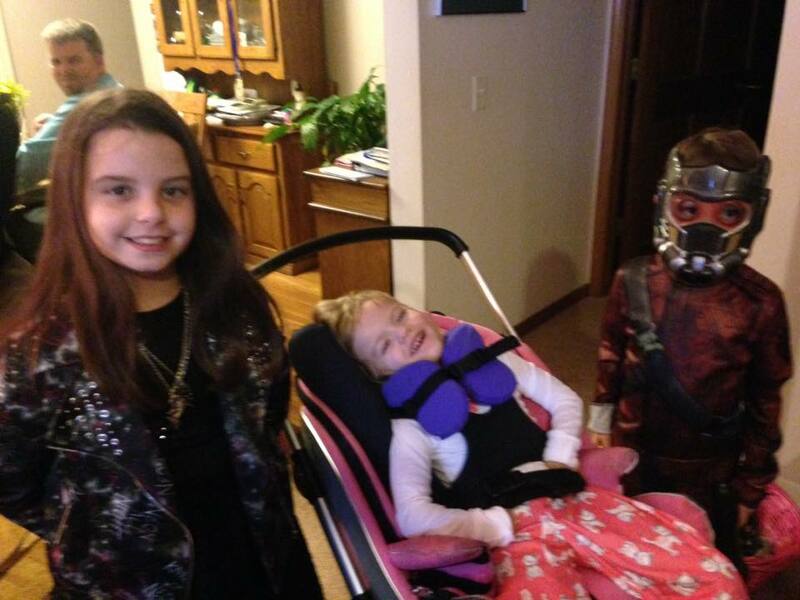 Grace loved visiting with her friends when they came to trick-or-treat. 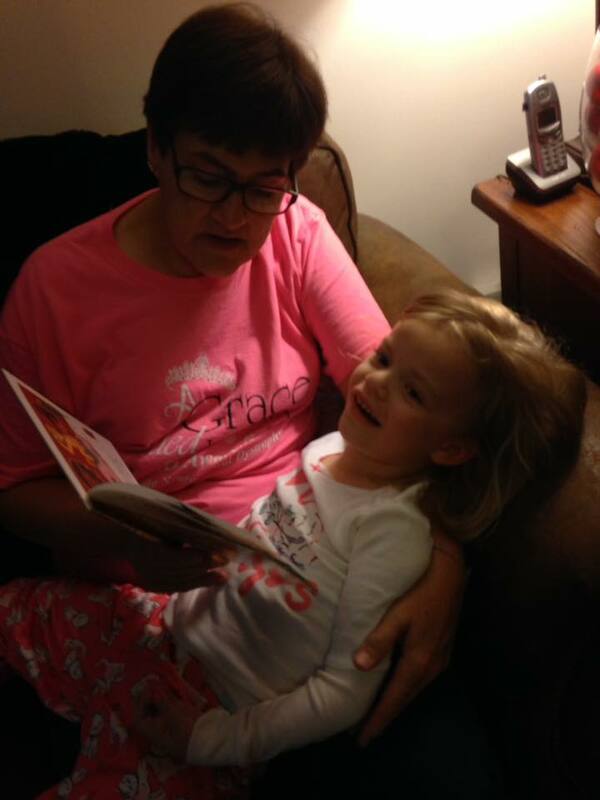 Reading a new Halloween story with Grandma Susie. Before long, it was time to go home, as another Halloween was done. Even though we didn't get our pumpkins carved, we still enjoyed celebrating together. We can't wait for next Halloween! Kyle is already coming up with costume ideas that Grace can do with her baby sister. We will never let INAD slow us down from making memories together. One of the first contacts we made after Grace was diagnosed with INAD was to the NBIA organization. NBIA stands for Neurodegeneration with Brain Iron Accumulation, and their headquarters is located in Portland, OR, under the direction of Dr. Susan Hayflick. Actually, it was our geneticist at Children's Hospital that made the initial contact for us. When I contacted the NBIA, they already knew who we were, which was a nice transition for us in a very scary time. I spoke on the phone to Allison Gregory, who works with Dr. Hayflick. She took some of Grace's information, and talked to me more about INAD and what it meant for our family. We have kept in touch with Allison and the NBIA over the last few years, and this summer, she asked about some of our fundraising efforts. I told her we had been blessed to live in a very generous community, and that we had been able to raise around $130,000 in the two years since Grace has been diagnosed. Grace was SO excited to help out with the OHSU natural history family study. Most of that funding (around $100,000) has been donated to Washington University in St. Louis, MO, to Dr. Paul Kotzbauer. He and his research team are studying potential treatment options for children with INAD. In the course of our conversations, Allison told me the NBIA was applying for a grant to start a natural history family study for PLAN families (and INAD is a type of PLAN). PLAN stands for PLA2G6 neurodegeneration, which refers to the gene that is affected. When it presents itself in infants and toddlers, it's known as INAD. Allison and Dr. Hayflick were applying for a grant with the FDA, but were looking for the support of INAD families to get started, and they knew our INAD family community was strong. In the past three years, INAD families all over the world have raised more than $500,000 and have funded two research studies. She said they were asking for the INAD families to pledge $30,000 for the next three years to get the study started, and they hoped to supplement the research with the FDA grant. What this study will do is gather data and information, and lots of it about the INAD kids and their families. With two active research studies, the group wants to be ready for clinical trials when the time is right. After talking to two of the other moms, we decided this was something we definitely wanted to get behind. Our iCan for INAD crowdrise online fundraising account had close to $13,000 in it that we thought would be a good start. I said that Kyle and I had about $28,000 from A Grace Filled-Journey, and that we would fill in the remainder. Dr. Hayflick and her team at OHSU, and they are grateful for the donation too! 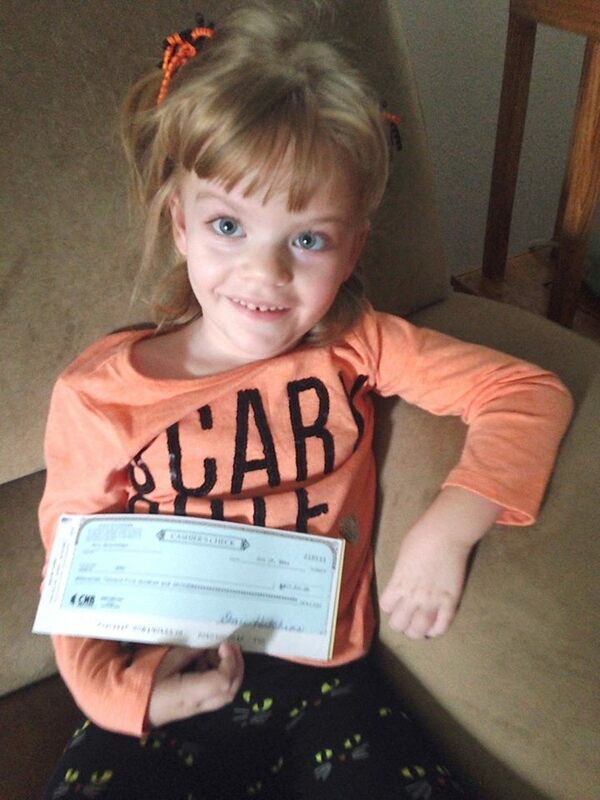 So, this week, Grace and I got a cashier's check for $17,500, and mailed it to Dr. Hayflick at the Oregon Health and Science University in Portland, OR. It felt really good to be able to jump in and send funding when it was truly needed. Thanks to all of our generous followers, the NBIA will be able to get started on this study immediately. We still hope and pray that the FDA grant funding comes through, and they should hear in December. Kyle and I are still planning to financially back Dr. Kotzbauer and his work at Washington University. He will finish up the second year of his study in the spring, and is excited that he and his research team continue to make progress. They should be able to start screening some drugs in the coming months, and he plans to keep us updated on his funding needs. 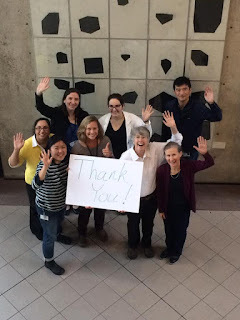 From the bottom of our hearts, we could not be more grateful to each and every one of you that have donated to INAD research over the last two years. We want you to know what a difference your generous gift has made, and continues to make. Together we will #BeatINAD.